An alternative title for this post could be “Sewing clothes I hate wearing to see if I like them more once I’ve made them myself”, but I thought that was a bit of a mouthful. See, I have a bit of a conundrum, I hate having a cold neck (or even worse, having a cold breeze blowing down my back! ), but I also hate having things tight around my neck or across my throat. Generally, turtlenecks make me feel claustrophobic and a bit panic-y, but I keep seeing all these stylish ladies wearing them and I was jealous of how warm and toasty they must be! So I thought I would have a go at making my own, using the Papercut Rise and Fall Turtleneck patterns. I made both versions, to see if I preferred one over the other. Rise is a classic turtleneck, with set sleeves and a short, close fitting turtleneck. Fall is looser, with a drop shoulder and a much longer, looser turtleneck which can either be folded over on itself or left scrunched down like in these photos. My Rise version is a black merino/lycra blend, and the Fall turtleneck is made out of a dusty rose coloured merino, both from the stash. I sewed both up with my overlocker, and used my coverstitch for the hems, so they’re looking nice and neat! I used a standard two needle stitch for the hems on the black one, as I have lots of spools of black thread, but I had to use a single needle chain stitch for the pink one because I only had a tiny bit of matching thread left, nowhere near enough for two rows of stitching! I cut a size XS in both tops, which is my standard size when I’m sewing Papercut Patterns. I was slightly surprised by how short both tops came up, both in the body and the sleeves. The sleeves on the black version in particular are bordering on too short, but I don’t want to add cuffs! I find them a bit fussy, and I like how simple the lines on the Rise turtleneck are. I’ll just need to remember to add a couple of centimeters to the length of them if i made it again! The sleeves on the Fall turtleneck are a better length, I think I might have turned up a smaller hem since I was using chain stitch to sew the hem. I’m surprised I like them both as much as I do, but I’m even more surprised that I prefer the Rise version to the Fall! I assumed that the looser neck on the Fall would be more comfortable to me, but the turtleneck on the Rise is loose enough that it isn’t pressing on my throat, and because it’s short and light it doesn’t collapse against my neck like the Fall version. I also prefer the slim set in sleeves over the dropped shoulders on the Fall, I keep feeling the dropped shoulder seam rubbing on my upper arm and thinking it’s my bra strap slipping off my shoulder! Either way, they’re both stopping the Wellington southerly gales from getting down the neck of my tops, which I’m appreciating at the moment. Earlier this year I was very flattered to be contacted by Sew Over It to ask if I would be interested in testing their latest online class, for either the men’s Hackney Shirt or the women’s Ultimate Shirt. I’ve never done any pattern testing before, and I’m a bit wary of the whole process, but when I realised that SOI weren’t asking for any publicity, just feedback, I decided to give it a go. I actually really enjoyed it, I quite like proof reading and editing work, and it was fun to have a look at the SOI online class model (which is excellent). I opted to make the Hackney Shirt, as I’ve been telling Hamish that I’d make him a shirt as soon as I found a pattern that I liked the look of, and this one seemed to fit the bill! I’m so happy with the sewing on this shirt, I’m really proud of the finish and the way the details came out. I think the collar and plackets are the best I’ve ever done! They’ve come out very neat and symmetrical, though the sleeves are too long on me. I could take the cuffs off and shorten the sleeves, there’s plenty of length in those plackets, but the chances of me wearing the sleeves unrolled are very slim so I’m not sure I’ll bother! I enjoyed following along with the online class, each lesson was nice and short and made it easy to follow along with each step, and Lisa Comfort describes and demonstrates everything in a really straightforward way. The videos for the tower plackets in particular was very easy to follow, and made a fairly fiddly step in the instructions clear. In the end I grabbed one of my newer patterns off my shelf, the Deer and Doe Myosotis Dress, and paired it with this gorgeous printed cotton from my stash. It has a print similar to an ikat, with irregular squares and lines, but it isn’t woven into the fabric. I bought it from Drapers Fabrics a few months ago, planning to make a classic shirtdress out of it, but when it arrived it was much softer than I expected. I’m pretty sure its a double gauze, I was able to separate the layers and it was pretty shifty, so wouldn’t have held the crisp lines of the dress I was planning. Its lovely though, and it was perfect to pair with this pattern instead. There is a bunch of fabric in those ruffles, but they feel really light and airy in this fabric, and the Wellington wind was definitely showing them off last night before we got to Frocktails! I was a bit hasty with my cutting out, and I unfortunately didn’t notice that the bottom layer of my fabric had shifted pretty significantly off grain. It’s pretty loosely woven, so it moves around a lot! That means that the pattern on the fabric doesn’t run in nice straight lines and is a bit all over the place, but I’m telling myself I’m ok with it. The Myosotis pattern was lovely to sew, as I’ve found all Deer and Doe patterns to be! My measurements fall neatly between size 38 and 40 on their size chart, but looking at the finished garment sizes I was confident in picking the 38! I did have to laugh when I tried on the bodice, the “empire line” waist was the perfect length for my short torso. I left it at the drafted length, because I thought it would look super weird if I shortened it any more. The only change I made was to add a couple of inches onto the skirt before I added the ruffle. I’m not sure if I lengthened it too much, but I think it’ll be a good length for summer when I want to wear it with bare legs and sandals. I was trying to think of the last time I made something with a gathered skirt, and I genuinely can’t think of when that would have been. I’m just not really a gathered skirt kind of person! I do really love the bodice of this dress though, the shaping with the darts is perfect to balance out the loose silhouette without swamping me, and the neckline and collar is so cute. And it has pockets, of course! Frocktails was great fun, it’s always nice to know that people won’t think you’re weird if you ask to feel their clothes! 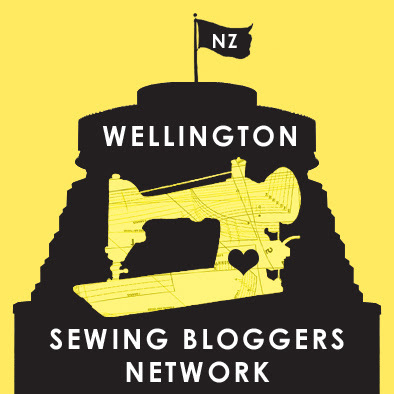 I now have a bunch of new patterns I want to make, courtesy of what everyone else was wearing… There’s going to be one in Auckland in mid August, hope you’ve got your tickets if you’re up there! I often buy patterns when they’re first released, intending to make them up pretty quickly, and then my tendency to procrastinate and inability to settle on a fabric kick in and I rarely make them up as rapidly as I intended. The York Pinafore by Helen’s Closet is one of the few which I printed and made up within a week of buying the pattern! I think it helped that I was primed for it’s release, I had seen Emma’s tester version and loved it immediately, and I knew it would be perfect in a few fabrics I had in my stash. I was a little bit wary of the cocoon shaped skirt on the York, so I decided to make it up in some fabric that I wouldn’t mind losing if it didn’t work out. This is a lightweight stretch denim from the Fabric Store that they were selling cheap because it was massively overdyed. I washed it a couple of times, and it came right though! It’s indigo on one side and black on the other, and I used the black side (which I think is the wrong side, but I wanted it to be really neutral so I used it anyway!). Because it’s winter, and I wanted to be able to wear it comfortably with tights, I lined it with a stretch poly lining from my stash. I have no idea where that came from, but it was perfect for this project! I used some vintage turquoise bias tape around the arms and neckline, and had just enough to do the hem as well. So satisfying to use up so many bits from the stash in one project! I cut a size small, which was a little smaller than my measurements but I thought there was enough ease that it’d be ok, and would tone down the cocoon shape that I was a bit worried about! I shortened it an inch at the lower lengthen shorten line, and and half an inch at the upper lengthen/shorten line on both the front and back. I wanted the bottom of the scooped sides to hit at the smallest part of my waist, as I thought that would look best. I cut the length half way between the long and short hem lengths, and I love where it’s sitting. I used the patch pockets, which are awesomely huge and deep! I saw a version where the patch pockets had been turned into welt pockets, and I would love to try that on another version. They looked really sleek and modern with the rest of the silhouette. And it turns out I really like the silhouette! The cocoon shape is way more flattering than I thought it would be, and its a really easy and comfortable dress to wear. I can imagine wearing it over nearly all of the tee shirts in my wardrobe (I love it over all my stripes! ), and I think it would look cute over my shirts as well. I’m wearing it here with my latest Lark Tee, a boat neck version made up in a rayon stripe that I bought at Fabricabrac a few weeks ago. Its lovely and soft, and I love the navy and white! I do need to go back and add a label into the back neckline though, I thought I would be able to tell them apart but I’ve just realised that I put it on back to front when I was getting dressed this afternoon (after trying on some wedding dresses, so much fun!). Clearly not so easy to tell the back from the front as I thought! Hi team! My research proposal is handed in, and a month away from both blog and sewing machine seems to have helped to kick start my sew-jo again. We’ve just had a long weekend which I put to pretty good use, making a dress for my mum as well as managing to finish off the jeans and jumper I’ve had cut out for months. They’re both boring basics, but they’ve filled a hole in my wardrobe that I have really been noticing now that the temperature has dropped! I really needed another pair of jeans, I was rotating between my Deer & Doe Safran Jeans and my blue Ginger Jeans, and the ankle baring Safrans are getting harder to wear the colder it gets! I bought some black stretch cotton twill from Miss Maude earlier in the year, and decided to turn it into another pair of Gingers. I made these the same as my first pair, with the high waist and skinny legs and the pocket stay. I realised when I revisited my original blog post that I had meant to fiddle with the legs to see if I could decrease the wrinkles at the knee and back thigh, but I had already cut this pair out! To be honest, I don’t think I need to fiddle with them too much. There are always going to be wrinkles on skinny jeans, especially these ones. The cotton twill is beautiful, and sewed and pressed so nicely, but it is fairly lightweight and definitely doesn’t have the same recovery as the denim I used for my first pair. it also has a bit of a sheen to it, so those wrinkles all catch the light! I look these photos after a few days of wear, and they’ve definitely loosened up around the hips and thighs and across the front. I kinda like how they have ended up looking more like close fitting trousers rather than jeans, it definitely means they’ll be easier to dress up. Next up is this super simple sweatshirt. I had a metre of absolutely beautiful lightweight ‘winter white’ wool from Tessuti, bought when I was over in Sydney a few years ago. I wish I had bought a bit more, because I couldn’t fit any of the patterns I wanted to make onto 1m (I really need to remember that I need at least 1.2m to get a long-sleeved top out of it)… In the end, after losing pattern tetris with a few patterns I decided to just go super simple and make a long sleeved top out of my favourite knit dress pattern, M6886. I cut it off at the lengthen/shorten line just below the waist point on the pattern, and straightened the side seams out. I also had to put cuffs of the sleeves, as I just couldn’t fit the full length sleeve on however I laid it out! I cut a wide facing for the crew neck, and again used the chainstitch on my coverstitch machine to sew down the facing and do the hem. I love the single line of stitching, it looks so sleek and simple. I really like how it’s turned out, I think it’ll be a great workhorse this winter. Yay basics! And yay for wool to keep me warm! Hi team! This is another long delayed blog post, I sewed up this Papercut Patterns Kochi Kimono last spring, but I’ve only just got pictures of it. I was planning on making another one in a Japanese cotton that I bought in London, and I planned to post them together, but I didnt have enough cotton in the end so it ended up as as this skirt. Then I planned to make a lightweight version in a wool/silk blend, but that hasn’t happened yet either…so you just get my original version! I made variation 1 in a fairly hefty felted wool blend from deep in my stash. The pattern does say you can use any type of woven fabric, but I think this is probably at the upper limits of what works for this garment! It’s heavy and stiff, but I actually love the severe, architectural look of it. It seems like a pretty deliberate contrast to a standard silky kimono jacket, and I like it, even though Hamish said it was very batty art teacher-ish! I love the split hem and the big roomy pockets, though the pockets end up being a bit weird when I have it done up. I made a couple of changes to the pattern to accommodate the thickness of the wool. I narrowed the sleeves by an inch at the armpit, tapering to nothing at the wrist and hem, to get rid of some excess bulk there. The fabric still forms pretty large folds at the underarm, but I’m beginning to think that’s just the way kimono-style sleeves sit. If anyone had a fix for this let me know! Of course, that fold would be much less obvious in a softer fabric…The other change I made was to omit the ties, and replace them with a length of grosgrain ribbon on the left hand side, and two gunmetal D rings sewn into the seam that attaches the neckband on the right. I love the more industrial style of this closure with the rest of the jacket, I thought bows or ribbons would be a bit soft looking, and it’s not too silly looking when it’s undone. I didn’t finish any of the seams, as this felted wool doesn’t fray. If I had known how much I would end up loving this I would have bound the edges with something pretty, but never mind! I hand sewed the neckline binding over on the wrong side, so at least that’s nice and neat. All of the other hems are topstitched. First up is this super cute little jumper. It’s the Livingston pattern by Nadia Cretin-Lechenne, which I fell in love with when I saw Abbey Morris post her version on instagram. I love the cute button up neck and the loopy texture on the front panel, and it was a fun wee pattern to make. I couldn’t figure out how the stitch pattern worked until I started knitting, but you slip two stitches for two rows, and then move them two stitches to either side with a cable needle on the third row. Simple and effective! Knitting the front flap was easier than I expected, though I did have to fudge it a little bit and do some tidying up at the edges of the openings when I sewed the ribbing down at the bottom of the openings on either side. I used Debbie Bliss Baby Cashmerino for the first time on this project, and it is so nice to knit with! It’s so soft, and the stitch definition is lovely. I initially bought two balls, intending to make the newborn size, but my friend is having a large baby according to her recent scans so I decided to make the 3 month size instead! I had to put a rush order in to get another ball so I could finish it in time for her baby shower, but it all worked out fine! He’s due at the end of the month, so if the sizing is right we’ll be in the middle of winter when he fits it, which would be perfect. I picked some plastic tortoiseshell-ish buttons out of my stash, I like that they’re fairly neutral but not boring. To finish off the gift I made up a couple of pairs of tiny sweatpants using some merino sweatshirting left over from my other projects. I used the Streaky Legs pattern from Ottobre Magazine (Spring issue 1 Kids from 2015), there are so many good patterns in that magazine! These pants are super simple, just two pattern pieces (front/back and cuff), and they’re so cute. The sizing is done by measuring the height of the child, which is a bit tough when a) you’re making a gift, and b) the kid is still in utero, but I had a guess and hopefully they’ll fit! Stupidly I didn’t look at the instructions, because they were so simple, but if I had checked I would have noticed that there were no seam allowances included in the pattern. Unfortunately I didn’t pick that up until I was checking to see how much elastic to put in the waistband. Being a European pattern from a magazine I should have expected that there were no seam allowances, so it was a bit stupid of me. Hopefully they’ll fit for a little while at least! For my other baby gift I made up a couple of baby bibs and a little sun hat in some super cute matching cotton. I love that there are lots of uses for craft cottons when making baby stuff, there are so many gorgeous prints that I would never use otherwise! I used two free patterns, the Purl Soho Bib and the Oliver + S Bucket Hat. Both patterns were really easy to use, and I love the results for each! I chose a woodland themed cotton from Stitchbird Fabrics for these gifts, as the baby I was making them for is a Canadian/Kiwi and I thought he would appreciate the bears and squirrels (eventually). I paired the cotton with more remnants from my stash, the orange is the left over linen from my Harvest Tee. I thought it was a slightly unexpected colour to pair with the muted colours of the cotton, but it matches the squirrels and deer and I liked the contrast!